A pioneer of social satire, she strongly influenced Black comedians Richard Pryor and Whoopi Goldberg. In her comedy routines, Mabley adopted a stage persona based loosely on her own grandmother but with a distinctly cantankerous and sassy edge. She was known for her folksy humor and ribald jokes and affectionately referred to her audience as her "children." 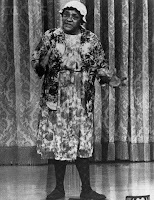 Onstage Mabley became famous for her gaudy house-dresses, floppy hats, and over-sized clodhoppers. During the 1960s, she recorded more than 20 albums of her comedy routines and appeared on television shows hosted by Harry Belafonte, Mike Douglas, Merv Griffin, Flip Wilson and Bill Cosby. A year after starring in the feature film Amazing Grace (1974), Mabley died of natural causes at the age of 78. What do you remember of 'Moms' Mabley? I remember Moms Mabley. When I was growing up she was a staple in my parents album collection. They would sit and listen to her with their friends. Of course, we weren't allowed to listen to her until we were older. She was definitely a character. And she was definitely not afraid to speak her mind on a variety of subjects. But what I remember the most is this:"My husband was so old that when I asked him to pass the salt and the pepper, he had to hand me one grain at a time because he was so old and weak." I also remember this:"He promised to comeback and scratch my eyes out. So I buried him face down so when he digs, he'll end up in China." A nice tribute to one of the pioneers of stand up comedy. Lady D - Oddly enough, I remember the Richard Pryor and Redd Foxx albums in my neighbor's house ... we didn't have them at my house (to my knowledge). I would listen at the neighbor's house when I was being 'babysat' for over there. My father had Moms Mabley albums. I was really young, but I laughed and laughed. I would play her albums when my parents were out. Susan - I remember having milk crates full of records back in the day. I wonder if they still manufacture record players any more? Moms was definitely one of the funniest Queens of Comedy! Happy Birthday from two fabulous old ladies to another! Old Ladies Driving - Thank you for the link to that YouTube video. I was surprised at how many Moms Mabley videos were on YouTube. I remember my mother not listening to her albums!